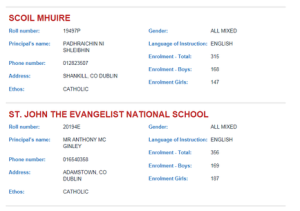 The Department of Education and Skills (DES) provides an up-to-date list of all Primary and Post-Primary Schools in Ireland on their website. To make your search as convenient as possible, we have outlined 12 steps below which take you step by step through the process of finding a school using the DES website. Click the link provided above and it will bring you to the home page of the Department of Education and Skills website. At the top right of the Department home page you will find a button ‘Find a School‘. 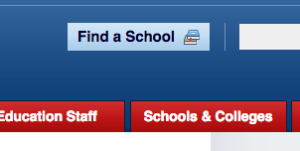 Click on this button and it will bring you to the ‘Find a School‘ page. ​The best of these options is the third as you can gear your search towards your preferred location and school type. To successfully complete a refined search each of the provided fields must be filled. In the first field ‘School Level’ specify what school level you are looking for, i.e. Primary, Post Primary or Special Education. In the second field ‘Geographical Area’ specify what school location is most suitable for you. In the fourth field, specify what language of instruction you wish your child to receive at school. Are you looking for a school where: all subjects are taught through Irish, some students taught all subjects through Irish, some students taught some subjects through Irish or no subjects taught through Irish. Finally, in the fifth field simple specify whether you wish for your child to attend a school that is: all boys, all girls or mixed gender. Your complete refined search bars should look something akin to the example provided here. When all fields are filled simply press the Search button to continue. 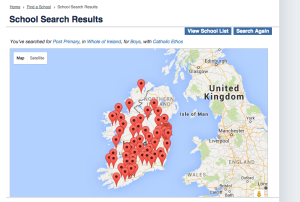 After pressing the Search Button you will be brought to a page with a map of Ireland where all of the schools fitting your preferences are marked with a pin. Here, you can zoom in on the map to see schools. However, if this style of viewing is not preferred there are alternative options provided on this page. One such option can be found at the top right of the page. Here, you will find a button titled ‘View School List’. ​Simply click this button and you will be provided with a list of the schools fitting your search as well as descriptions of each school. By clicking on the ‘View School List’ button you will be brought to the list page. On this page each school fitting the specific traits that you outlined at the beginning of your search in the provided fields is presented. All details pertaining to each school is made available: roll number, principal’s name, contact details, gender, ethos and the number of students attending the school.